Welcome to the Pink Lemonade Mama Cloth Giveaway sponsored by the Pink Lemonade Shop website and hosted by The Parenting Patch. The Pink Lemonade Shop offers a line of luxury, reusable, handmade cloth menstrual pads made with top quality fabrics. Heather at The Parenting Patch recently reviewed a 6-inch mini pantyliner, a 7.5-inch regular pantyliner, an 8-inch light pad, and an 11-inch overnight pad from Pink Lemonade. Her Pink Lemonade reusable minky menstrual pads are her new favorite mama cloth. Super absorbent despite a heavy flow, Pink Lemonade minky pads are also super soft but never bulky. The colors and prints also make that time of the month a little less dreary. If you are looking for some new mama cloth to try, she cannot recommend Pink Lemonade reusable pads enough! 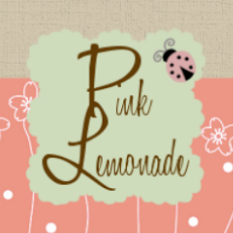 For more information, check out my full Pink Lemonade Mama Cloth Review. 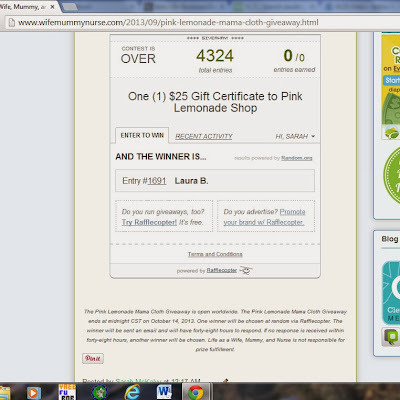 One lucky reader of The Parenting Patch and YOUR BLOG will win one (1) $25 Gift Certificate to Pink Lemonade Shop. 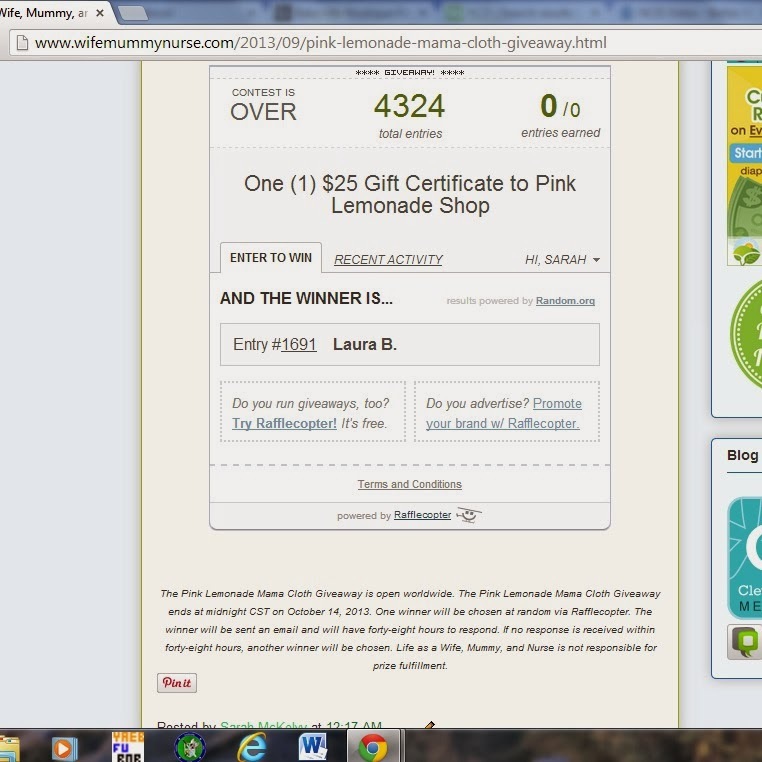 To enter to win the Pink Lemonade Mama Cloth Giveaway, simply use the following Rafflecopter form. The first entry is free. All other entries are optional; however, the more entries you have, the better your chances of winning. Good luck! The Pink Lemonade Mama Cloth Giveaway is open worldwide. The Pink Lemonade Mama Cloth Giveaway ends at midnight CST on October 14, 2013. One winner will be chosen at random via Rafflecopter. The winner will be sent an email and will have forty-eight hours to respond. If no response is received within forty-eight hours, another winner will be chosen. Life as a Wife, Mummy, and Nurse is not responsible for prize fulfillment.